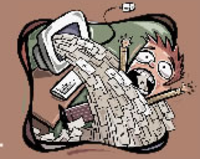 Link: Death By Email Blog: Senate OKs 7 Years of No Email Tax. Roger Matus reports today that the Senate has passed a bill delaying any taxation of the Internet and email for 7 years. Email has become a preferred method of communication for many lawyers and clients; it avoids the stamp tax of the Postal Service. Of course, email has many disadvantages; not the least of which is the ephemeral, find me if you can, nature of electronic communication. The feeling of informality in email communication has lured more than one communicator into an embarrassing or legally risky error. I suspect that the first Egyptian Pharaoh who put pen to paper immediately sensed the permanency provided by such communication. However, I don't think the Pharaoh had the problem of hordes of hungry lawyers seeking discovery of his scrolls. Link: Home Office Lawyer: Blawg Review #132 -- Home Office and Solos. If you want to get a bird's eye view of what is out there in the world of law blogging, you need to check out BlawgReview; this month's edition is hosted by one of the best, Grant Griffith's - Home Office Lawyer. Some of the blogs I read regularly I have found at the Review. Check it out. Grant is an Apple fan, but we don't hold that against him. 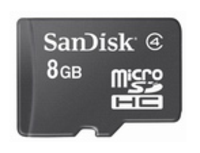 Link: SanDisk | Products | Mobile Products | microSD Cards. 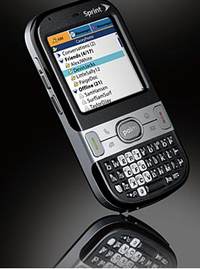 The new Palm Centro is a small, pocketable smartphone with the same functionality as a Treo 700p, but costing only $99 with a contract. The principal difference from the Treo is its use of the tiny Micro SD card for external storgage. Now, however, that disadvantage has disappeared with the introduction, by SanDisk, of a $139.99 Micro SD Card with 8 Gigabytes of capacity. Smaller and smaller; down the rabbit hole we go, Alice! Lost In Space - Whom Do I Sue? Link: Law Blog - WSJ.com : Law Blog Q&A: Space-Law Expert Henry Hertzfeld. Calling it space law might be somewhat of a misnomer. Space Law is actually International law practiced with an eye to the future. When that future spacecraft fails to return, who bears the liability for the cargo? Whom, if anyone, can the survivors sue? Should space travel be cloaked with some sort of immunity from liability? What about the legal relationships between countries who share a project to go into space? What, exactly, is space, anyway? This article, and the laws it links to, will give any lawyer a general background in this growing area of law. Like Internet law, it is actually a hodgepodge of other legal disciplines, applied to new geography. Link: Excite News - Senators Want Probe on Content Blocking. It is good to see that Congress is finally doing something productive. After the stories about Italian legislators' attempts to stifle Internet communications by requiring blogger registration now we see the Congress investigating the alleged blocking of Internet traffic by the Telcos in order to prevent users from using too much bandwidth. I agree that Internet hogs need to be controlled; however, secret limiting of traffic by the ISPs is so NOT the answer. 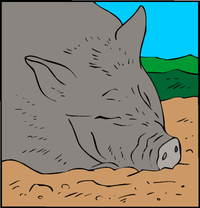 What your mother said was true: "Let Sleeping Hogs Lie". 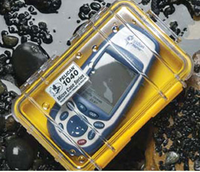 Link: Stuff We Like: Keep Your Gadgets Safe with the Pelican Micro Case. Once upon a time, in a galaxy far, far away, I took a canoe ride. Being FutureLawyer, I had my Palm Pilot (yes, that is what they used to be called) and my cell phone (this was before convergence devices) with me. Can you guess the rest? My date tipped the canoe, aggravated by a passing speed boat wake, and my Palm and my cell phone were dumped into the water. Toast. Dead. Not revivable. Well, this product would have prevented the heartache. It might be a pain to carry around, but it could save you. Link: The News-Press, news-press.com, Opinion, First Amendment rights in the blogosphere. This interesting article in a Florida paper discusses the problems inherent in fighting defamation cases that spring from Internet postings. Does the legal system adequately permit the redress of defamation committed on the Internet? It certainly is expensive. In addition to legal fees, court costs, and the discovery costs of traditional litigation, additional expertise must be engaged which is experienced in the technical aspects of the Internet and technology. The current flap over a proposed Italian law to limit the establishing of blogs is instructive. In a country that values free speech, the United States is being tested by technology that permits defamatory content to be spread immediately and over the entire planet. In the Italian proposal, a "responsible journalist" must be named as the responsible party for a proposed blog; apparently, an attempt to require an individual to step up in the event of a later problem with the blog. If the law passes, many problems ensue. What is a "journalist"? What sort of regulations of blogs will be created by the Italian bureaucrats charged with enforcing the registration law? Of course, such a law would never pass in the United States. Or, would it? Link: How To Make The Cell Phone Into A Portable Scanner | Newsweek International Edition | Newsweek.com. I have posted before about ScanR , a free application that uses the Treo cell phone camera as a scanning device. Just snap a photo, and email it to yourself. Very cool, and I use it regularly. So, when a reporter from NewsWeek called, I was happy to talk to her about the product. Just another thing you can't do with an IPhone. Link: The Trial Technologists View � Blog Archive � First Hands On Impression: Palm Centro. I was happy to see this review by Blake, at Trial Technologist, about the Centro. As every regular reader knows, I am a Treo 700p user and abuser, and I have often made excuses for its chunky form factor. The only problem with the Centro is that it isn't available on Verizon Wireless. Hopefully, soon, as I would love to try it. The Fickle Finger of Fate? Link: Phone Fingers fight smudges, protect against STDs* - Engadget Mobile. This product photo conjures so many funny scenarios that I am almost embarrassed to show it. Oh, okay. How about "Is That Your Finger, or are you just happy to see me?" Or, "Is this guy a proctologist or an Apple Fan Boy?" Well, you get the picture. However, I don't think there is a chance in Hell that even Apple fans will want to be seen walking around with a rubber finger...or will they?